I know this has been discussed numerous times and most of those times the slave bios was not activating. What I'm experiencing is this. Although precision XOC lets me move the power target slider to 127% the card is power limited at 117%. If I run a game that runs the GPU under 117% power then the card runs at 2100MHz constantly (every game I tried runs the card at around 100% power). If I run, let's say, Furmark, the card runs at around 1880MHz at 117%. If the slave BIOS was working correctly, then the card would go to 127% (at least this is what I understand). Precision XOC and Furmark both say that the card is power limited. My GPU temps do not pass 37C, and the rest of the sensors are under 45C. Slave bios is 86.02.39.01.90. Just to be clear: I am not saying that the card under-performs, on the contrary, it OCs to a stable 2100MHz during gaming with no frequency dipping whatsoever. The reason I'm opening this thread is that I believe that the slave bios, or something else is keeping the GPU from working as a FTW3 should. "Not hitting the power target is actually not a bad thing, it does mean that the card is able to reach the maximum performance set by GPU-Boost without requiring the full power target to do so. Please also note that the power draw and power target used may vary from application to application even though you see 100% GPU load, and there may also be other limiting factors like temperature or stable voltage from the PSU, but the clock your card is reaching does see to be quite alright." "The GPU clocks are controlled by Nvidia Drivers, and once the GPU clocks reaches maximum ( max Boost) Driver controls the power factor to certain limit even though power target is set to 127%. If your GPU is giving Maximum performance at 117% it means you have one of the good GPU on the Graphics card. Which means Your GPU needs less energy to reach Peak performance. But Some Graphics card may need 120% or upto 127% to get peak performance. The Power Target and Temperature targets are supplementary to Nvidia Boost. Once Graphics card reaches peak of the performance at certain Frequency. Driver controls the power target for the stability of the Graphics card, Please go through following link to know more about Nvidia GPU boost 2.0. Nvidia Driver play main role to control overall performance, Even though the BIOS has set 127% power Target, "
In my opinion he is not on the subject even if I tried explaining three times already. #1 If you own a 6696 download the ftw3.rar. If you own a 6698 download the ftw3_hybrid.rar. #2 Extract all files to the desktop. #3 Shutdown pc, unplug psu from wall, hold case power on button for 30 seconds. #4 Move vbios selector switch to the slave position. The vbios selector switch can be located to the left of the two 8-pin power inputs on the card. #5 Plug psu back into wall & boot pc. #6 Open precision xoc and verify you're on the slave vbios. If you're on the slave vbios you should be able to slide the power target slider to 127% inside precision xoc. Close xoc. #7 Use the secondary.exe to update the slave vbios. Shutdown pc, unplug psu from wall, hold case power on button for 30 seconds, replug psu back into wall & boot pc. Reinstall graphics drivers if necessary. #2 Extract all files to your c:\ drive. #7 Run command prompt via administrator. - Windows 7: Press the start button and type "cmd", right click "cmd" in the list that pops up and select run as administrator. - Windows 8/10: Press the Windows Key & X keys together, right click "command prompt" and select run as administrator. #8 Type the following commands into the command prompt... "cd c:\nvflash(3)" without quotes and hit enter. - Type "nvflash64 -6 FTW3Slave.rom" without quotes and hit enter. #9 If you get an error stating "Firmware image PCI Subsystem ID <xxxx.xxxx> does not match adapter PCI Subsystem ID <xxxx.xxxx>" just ignore the error (this error will cause no harm, it's just letting you know you are changing the subvendor name/subsystem id on the card.) Continue on flashing by pressing "Y" to override the error. nvflash should now flash the FTW3Slave.rom to your card and complete by saying the flash was successful. #11 Download the ftw3.rar & extract all files to your desktop. #12 Use the secondary.exe to update the slave vbios. Shutdown pc, unplug psu from wall, hold case power on button for 30 seconds, replug psu back into wall & boot pc. Reinstall graphics drivers if necessary. Note: If you own a FTW3 that runs at 12 GHz on the memory you'll need to use msi afterburner to overclock the memory back to 12 GHz as you'll be installing a vbios that will run the memory at 11 GHz. If you own a FTW3 DT card you may notice instability as you just installed a regular ftw3 vbios onto your card. The original ftw3 slave vbios is included in the nvflash.rar file listed under the 6699, 6796, 6797, or 6694 update procedure. Furmark is blacklisted by Nvidia - intentionally throttled by the drivers to not run at full power. The GPU won't pull more power than it needs, that's very likely why you don't see the full 127% pulled. That's how it works - if it doesn't need it, it won't pull it. Period. 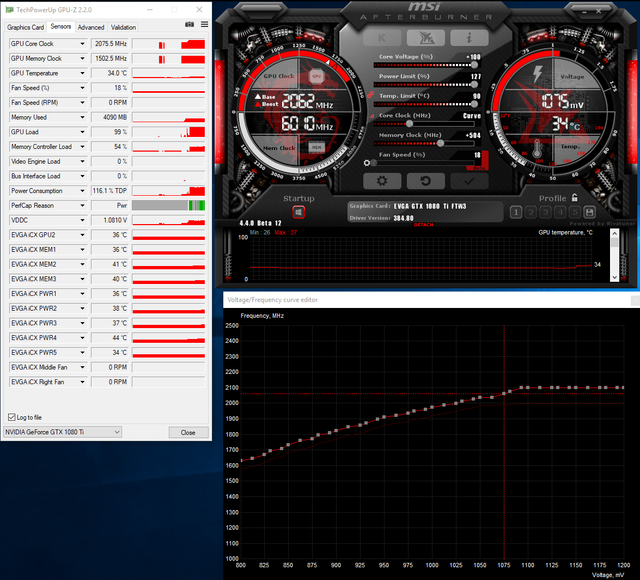 Try setting the voltage higher and run a heavy GPU load like Uniengine Superposition 4K Optimised or 1080P Extreme or 3DMark Timespy - you'll likely see more than 117% power draw especially if you increase the voltage. The fact that your card runs at 2100MHz stable WITHOUT dropping the frequency down due to a power limit (mine sometimes does that from 2063MHz to 1987 to 2012 during heavy load) means that you have a VERY GOOD card. A golden chip if you will. Stop complaining, you got a 1% card. And if you don't like your card and want to see that power limit hit then I'll trade you my 1080 Ti FE that does hit it's power limit. It does need it otherwise it would not downclock. Still throttles earlier than set. Secondly, have you tried it with MSI AfterBurner? It might be an issue with Precision. Did you power down your PC before flicking the switch? There's been a few people reporting that the changes don't take effect until a few reboots. Power down the PC then unplug it from the wall, hold the power button down for 30s and then boot it up, after its plugged back in of course. That should force it to load the selected BIOS. Just to be clear: I am not saying that the card under-performs, on the contrary, it OCs to a stable 2100MHz during gaming with no frequency dipping whatsoever. Sounds like there isn't a problem (I can't read those graphs as they're really compressed and pixelated for the text), yet maybe your card is broken. I take it you don't want to trade cards? I'll pay for both of our shipping costs. My card dips the frequency during new/heavy load benchmarks, and I very rarely ever see that happen during gaming. Welcome to Pascal and GPU Boost 3.0. Try setting Kboost in PrecisionX and Prefer Maximum Performance in the NVCP to see if that forces the card to work the way you'd like it to, over what Nvidia designed them to do. Come on with the Furmark thing. It emphasizes exactly what I'm saying. The card goes into Power Limit mode at 117% not 127%. If it were at 101,105,110 or anything other then 117%, I would have ignored it and blame it on the "Furmark Ban thing". But have confirmed this with both Time Spy and Superposition, albeit the toll on maximum boost is smaller than Furmark. Also, the slave bios is loaded. It is confirmed by both Precision and GPUz looking at the BIOS version (i have mentioned this in the OP). I have uninstalled Precision for testing sake and also went with Afterburner because the voltage/frequency curve is more granular than Precision, which increments frequency by 25MHz (don't understand why when the GPU clock increments in 13Mhz if I'm not mistaken). I'm keeping the card as you can imagine. I said this from the start. Or were you being sarcastic? Guys, if you don't want to read, or don't care about benching scores and only gaming, please stop posting. it's not helping as is the support tech that has my case. YES, I want to see this card power limit at 127%. PS: The linked images are clear enough. 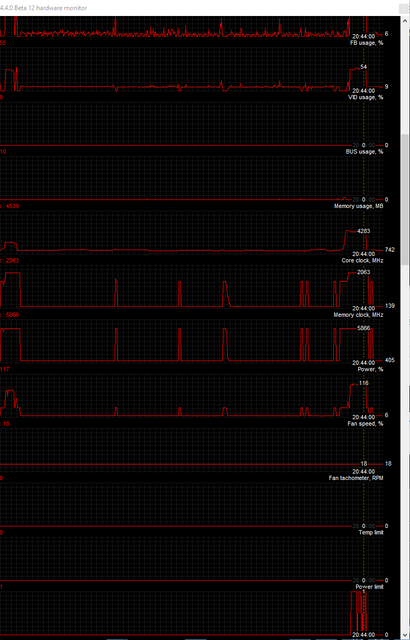 Anyway, they show a slight dip in frequency (~2080) and Power Limit at 116%. Welcome to Pascal and GPU Boost 3.0. Try setting Kboost in PrecisionX and Prefer Maximum Performance in the NVCP to see if that forces the card to work the way you'd like it to, over what Nvidia designed them to do. I did not contest that statement. What I argued is based on it. If the card down clocks due to Power Limit (as confirmed by Precision XOC), then why is it limited on 117% and not 127%? Does the slave FTW3 bios have the power limit unlocked to 127%? Does Precision XOC (or Afterburner) lets you move the power limit slider to 127%? Yes is the answer to both questions. Still I'm seeing a different behavior. Folding, from what I know from my old 980ti, does not even reach 100% on GPU load (not Power). I have this:11G-P4-6696-KR . 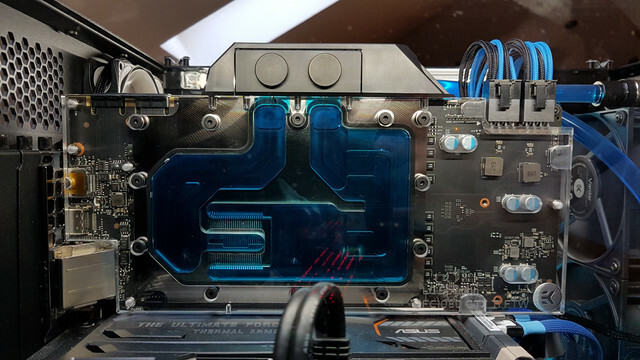 It's the FTW3 iCX air cooled on which I slapped an EKWB FTW3 water block . Temps, as mentioned, are below 37C. You can see the card is hitting the power limit at 117%, as you say. Its in the bottom right of the image in the first post. Then change the .txt file to .bat and run it. See if that helps. Thanks for posting the article. I read it when it was released, and refreshed the GPU Boost 3.0 now. What the article says, besides the granular ability in changing the frequency at each voltage mark, it also mentions the dynamic down clocking in comparison to the older cards. From what I've seen Pascal starts lowering the clocks at around 55C. This is not my case fortunately. Regarding folding. What you are seeing is normal "gaming usage" which usually does not push the card to it's power limit. Also, regarding the voltage, the limit is 1093mV. I suspect you only see 1081mV because of how the default curve is set up. You have the same resulting frequency at both 1081 and at 1093. Boost 3.0 will only go to 1081 because it's the same frequency. If you want more voltage, raise the curve at 1093 by one tick (try Afterburner as it can raise the frequency properly, not in 25Mhz steps as Precision XOC). If the card is not limited in any way (temps, power) you will see 1093mV. Funny thing: "Power limit for GPU 00000000:01:00.0 was set to 355.00 W from 355.60 W."
Hmm. 355W is 127% of the 280W standard with the 1080Ti FTW3. Unplugging it from the wall. Changing the switch to slave, if not already on slave BIOS. Hold the power button on the case/mobo for a few seconds. plug it back in and boot up. You could first try steps 1 & 7 and then if it doesn't work, then shut the PC down. A few other users were experiencing the same issue but rebooting a few times allowed the slave BIOS to kick in. From what I gather, the slave BIOS is activated. This is confirmed by the version of the BIOS read by gpuz 86.02.39.01.90 (86.02.39.00.90 is the master) and by the fact that Precision xoc and afterburner lets me move the power slider all the way to 127%. I will go through all those steps one more time switching to primary and again switching to slave and report back. Run the 8k optimized preset in superposition. I'm sure you'll get close to the 127% then. Run FS ultra or Superposition 4k with the GPUz sensors tab open. Crank up the clocks as high as possible, and post a screenshot of the GPUz sensors tab. If you're seeing green, or "PWR" in the PerfCap Reason line, then you have a legitimate ****, gripe or complaint. If you're NOT hitting the power limit, then the % of power the software is telling you the card is running at means exactly nothing. Also, a screenshot of your voltage / frequency curve would help. I redid the steps suggested but I get the same behavior. Ran 8k same thing, with some spikes at 123%. @kwkrnu72: I wouldn't have bothered opening this thread and documenting this behavior if I didn't do my homework. I do this all the time at least out of respect for you guys that take your time to read the forums. @1093 mV the frequency is set at 2100MHz. Hmm....with the frequency set at 2100 @ 1.093v, I would think it'd try to run there...or should. I also wouldn't think it'd be hitting the power limit already at 1.075v...or certainly shouldn't. Not if it was actually bumping the power limit up to 320+ watts. I'd either ask EVGA for a copy of the slave bios with the increased power limits, or RMA it. You're correct. It's not operating as intended. And chance getting a card that overclocks way less? To that I say: NUTS! Then again, some people can't stand things not working the way they expect them to - even if they are working better than the majority of the run. I did some runs on 117 vs 127 and compared the scores. What I saw was a difference of minimum 11 points and a maximum of 31 Points on 8k optimized in favor of 127% setting. So the power setting kinda works. I'm saying kinda because you don't gain much. Still, it is there, but I think that the BIOS can be improved to limit near 127% as "advertised". I will continue working with support and ask them for a copy of the slave bios as I believe it is not a problem with the card physically but with the BIOS. On 1080p Extreme, it stays at 2100MHz and never hits the power limit btw. Yeah, I saw that video earlier.....it's terrible, and he's way off on his particular problem. The power limit problem doesn't seem to be connected to temps / voltage, but to actual power draw....he's getting a power limit throttle with the GPU at 116-117%, which shouldn't happen if the bios was setup correctly. There's a problem in the bios. 11-31 points are within a margin of error....I could run it 3 times at the exact same clocks and get scores that are 100 points apart. 1080 isn't going to pull on the card as hard as the 4k setting. It doesn't surprise me that it's not hitting the PWR perfcap. Certainly. I am one of those but with one correction: It's not working as "advertised", my expectation is not surpassing that. But may I ask you one thing? Why is there a FTW3 card? @Sajin: I read the posts you mentioned before installing the card but the OP never comes to a conclusion. The other thread with the video slides away from the subject. The real question is it the vbios, card or driver at fault. Agreed. Judging on how my emails with the current EVGA tech are going, I think Volta gaming will launch and we would still be in the dark. Anyway, i charted the power and voltage chart during an 117 and 127 Superposition run. You're the thrid person that has reported this issue. I've reported this thread to evga. Thank you. I think this is something that they should look at. If it walks like a duck, quacks like a duck and looks like a duck....it's probably a duck. When I flashed my BIOS to a FTW3 a few weeks back, something strange happened. Although I had a supposed 127% power limit, the power wouldn't actually go above ~108% on the FE. 108% of the 280W from the FTW3 is... 300W that the FE is constrained to. Perhaps something similar is happening, though it's the same card that it's being flashed into so it would still have the 280W base power so limiting it to 327.6W would still be 117%. That's when I opted to try the XOC BIOS but I wouldn't recommend that.